child seat to be fitted. an anchorage point which allows a forward- facing ISOFIX child seat with universal approval to be attached. The anchorage points are located in the boot for the rear seats, and on the seat back for the front seat. F and G: cots in group 0 (less than Using a child safety system 10 kg). 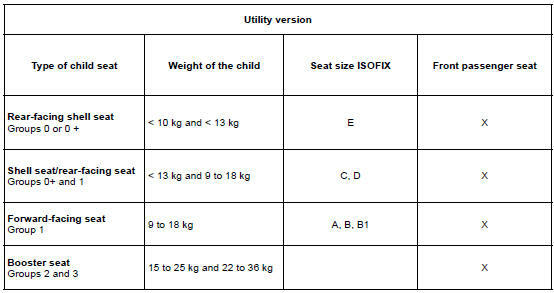 X = Seat not suitable for fitting child seats ISOFIX. 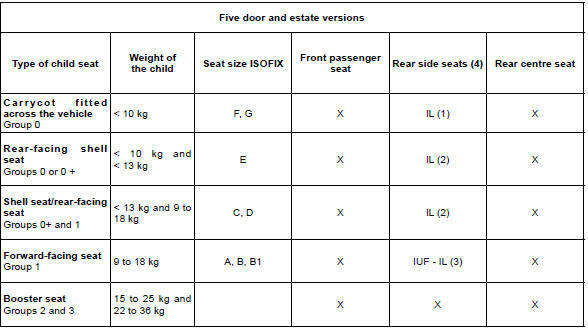 IUF/IL = On equipped vehicles, seat which allows an approved “Universal/semi-universal” or “vehicle specific” child seat to be attached using the ISOFIX system; check that it can be fitted. (1) A carrycot can be installed across the vehicle and will take up at least two seats. Position the child with his or her feet nearest the door. (2) Move the front seat as far forward as possible to install a rear-facing child seat, then move back the seat in front as far as it will go, although without allowing it to come into contact with the child seat. (3) Forward-facing child seat; position the seatback of the child seat in contact with the seatback of the vehicle seat. Adjust the headrest, or remove it if necessary. Do not push the seat in front of the child more than halfway back on its runners and do not recline the seatback more than 25°. (4) Make sure that the child seat or the child’s feet do not prevent the front seat from locking correctly. Refer to the information on the “Front seat” in Section 1.